A one-of-a-kind miniature replica of the Hogwarts School of Witchcraft and Wizardry for fans and collectors of Harry Potter and J.K. Rowling's Wizarding World. 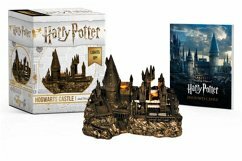 This kit includes a 4 x 3-inch molded collectible replica of Hogwarts with a flickering light along with a 16-page sticker book with eight Hogwarts-related full-color stills from the Harry Potter films. Consumable.